He teaches his players that you can never guarantee a win, but you can always earn the right to win—with focus, consistency, hard work, and anticipation of obstacles. And if you’ve earned the right to win, you can sleep soundly before a big game and take the field with confidence. 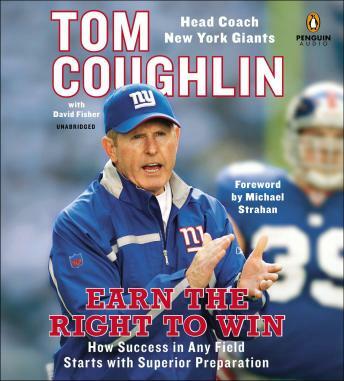 Now Coughlin brings his best advice and anecdotes to a wider audience, and shows how they apply beyond the gridiron. As he likes to say, the more you sweat, the less you bleed. He explains his attention to detail and his passion for knowing even the smallest bits of information that might affect a game. He also shows how to build flexibility into your plan and prepare for the unexpected. Coughlin blends insider stories with practical insights from his forty-year career, creating a powerful guide for leaders in any field. Great read!! Good insight on how a great coach creates a culture for winning.